Shower drain new generation Borinni gasket. “Borinni” gasket prevents unpleasant smell from the sewer even when the water evaporates from the sewer. Four types 550/700/750/800. Insert stainless steel ceramic plate of 1 mm. No unpleasent smell from the sewers. Low installation height, stainless steel, ABS. 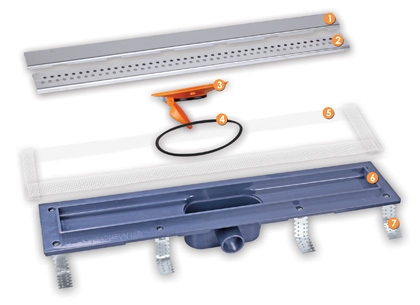 Shower drain with Borinni gasket, height 78mm, flowability up to 50 l / min. No unpleasant smell from the sewers. Low installation height, stainless steel, 1.2 mm ABS. Shower drain with Borinni gasket, height 78mm, flow up to 50 l / min. Five types of 550/700/750/800/850. With holes without a frame of plastic. No unpleasant smell from the sewers. Low installation height, stainless steel, 1.2 mm ABS. Five types of 550/700/750/800/850. Without holes, solid, hight quality grill. Low installation height, stainless steel, 1.2mm, ABS. Four types 550/700/750/800. 8mm tempered glass, stainless steel box with PVC bumpers. Shower drain with “Borinni gasket”, height 78mm, flow to 50l / min. Replace the existing standard DB Metaleks drains with a dry system drains. See instructions for repair.